Spiders, the creatures that comprise the genus Aranea, are an ancient group of creatures that existed on the planet for approximately 300 million years. One of their defining and fascinating adaptions is their ability to produce silk, a protein fiber which is believed to have evolved 386 million years ago. inconvenience caused by the frequent shattering of the delicate screens. We believe that this process, which draws inspiration from the majesty of the natural world and the primeval evolutionary process, will yield a cost effective and efficient solution to a 21st century predicament. While considering our possible project ideas, our group was particularly struck by the complex and unusually durable silk structure of the Golden Orb Spider. We brainstormed many possible ideas, but the basis of our thought process revolved around spider silk used as a reinforcing structure. This was due to the fact that spider silk is physically stronger and more elastic than steel and Kevlar. In addition, we were inspired by other aspects of the web; its property to change the pigment of its thread based on background light as well as its structural ability to isolate and reduce damage. Seeing these properties, we realize that they would be perfectly applied to modern touchscreen technology. Most every modern consumer has encountered the frustration and hardship of dropping, and in turn shattering, a smart phone touch screen. Data suggests that 26% of touchscreens shatter within the first two years of use. With the continued proliferation of touchscreens in our society, this problem will only escalate in coming years. Overall, it is a waste of time, money, and resources. Our project seeks to streamline modern life by bypassing this common occurrence. As well as protecting the quality of the consumer's investment, our project would have the added benefit of promoting ecological responsibility. The trend of shattering cellphone screens results in the improper disposal of cellphones, which contain several harmful toxins. A single battery in the cellphone is able to pollute 158,200 gallons of water. Furthermore, they contain other harmful toxins such as cadmium, chlorine, and arsenic. These have been linked to development disorders in mammals who come in contact with their presence. By incorporating Silk Screen into touchscreen technology, we hope to diminish the risk of discarded cellphones causing damage to the natural world. The design of the Silk Screen is derived from the web structure and silk of the Golden Orb spider family. It would mimic the structure of the golden orb spider's web which is designed to isolate damage. Often times when a phone screen is cracked, the damage can spread from a single area to the entirety of the screen. By utilizing this natural technology, small areas of damage can be prevented from becoming larger and more costly ones. 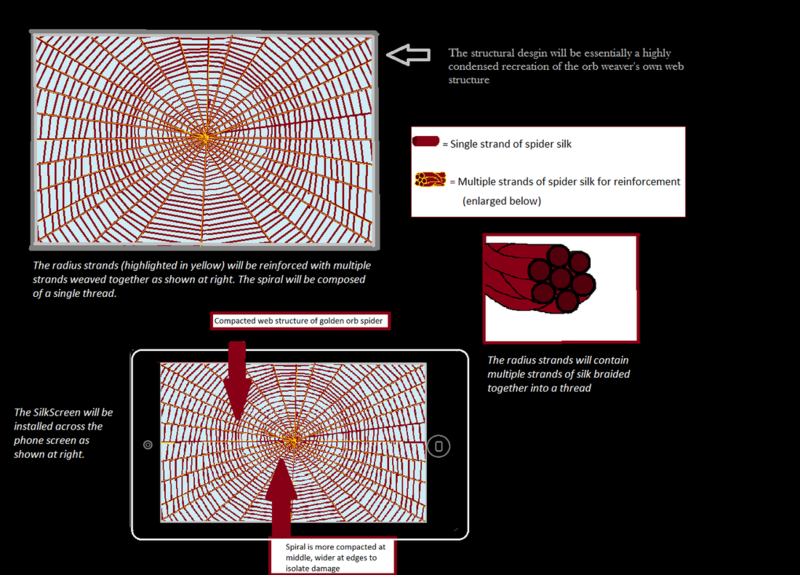 Our design for the Silk Screen would compact the design of the golden orb spider's web, and reinforce it by using multiple strands of silk woven together for the radius strands of the web as shown below. In considering the creation of our product it was necessary to determine the best location to incorporate the Silk Screen into the structure of the capacitive touch screen that would be effective as protective reinforcement while still respecting manufacturing requirements and function. After researching the structure of phone screens as well as examining the screens of phones taken in through our recycling programs we determined that the silk screen would be most effectively placed between the top glass layer of the screen and the plastic layer directly below it. The chemical composition of spider silk is made up of natural polypeptides, predominantly of glycine and alanine amino acids. These amino acids are the smallest and therefore are able to pack together tightly and form crystalline regions. These characteristics allow spider silk to be hydrophobic, elastic, and virtually invisible. Because of the nature of the chemical makeup of spider silk, we believe that it would not interfere with the electrical signals that allow touch screens to operate. This makes it an ideal material for use in smartphones, as it would not reduce the sensitivity and accuracy of the touch response. By nature, this project was not easy in terms of experimentation and in terms of constructing a prototype. Due to the elusive nature of spider silk, and due to limited funding, we where not able to construct a working model. As a result, we where unable to test the actual application of our prototype. As a group, we bypassed these difficulties by instead testing the problem of phone screen durability, and by utilizing Kevlar in our tests. Kevlar is a comparable material, in terms of elasticity and durability, and our data suggests that it indeed significantly reduced the likelihood for a touchscreen to shatter. In addition to this, we constructed a non-working hypothetical and large scale prototype, in order to display the design of our product. Through our research and experimentation, we have provided convincing evidence of the structural usage of spider silk in reinforcing touch screens. We hope that this will provide a foundation for future investigation and manufacturing of spider silk in the technological world.